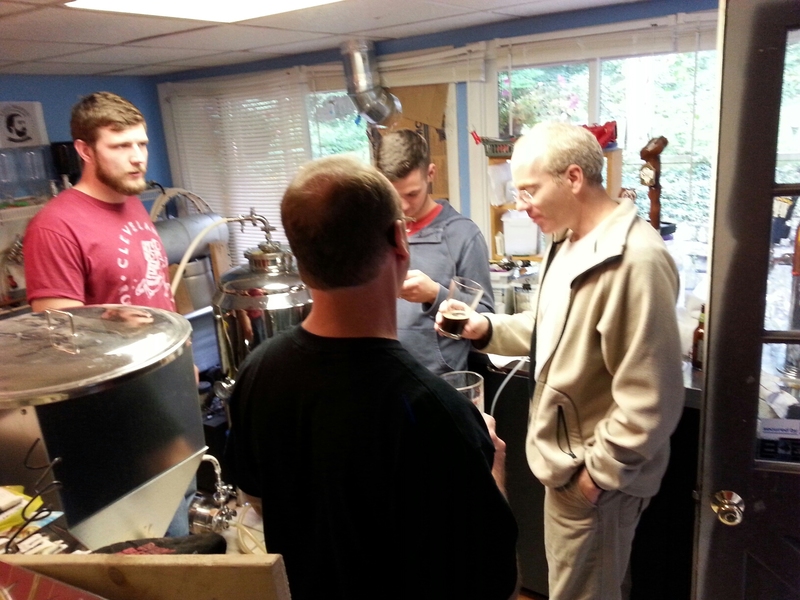 Harvest Brewday September 14, 2014! It was a perfect harvest brewday for a Pumpkin and an Octoberfest -cool and crisp outside which made brewing a lot more tolerable and not just a weekend weightloss program (lot’s of heat/sweat in a small space). I will preface this by saying that we pulled a late night at the brewery working on Thursday. On Friday I had to return rental equipment, order and pick up grain, filter and keg two beers and clean the fermentors before the brewday on Saturday. Needless to say, Jesse, John and I were already tired. 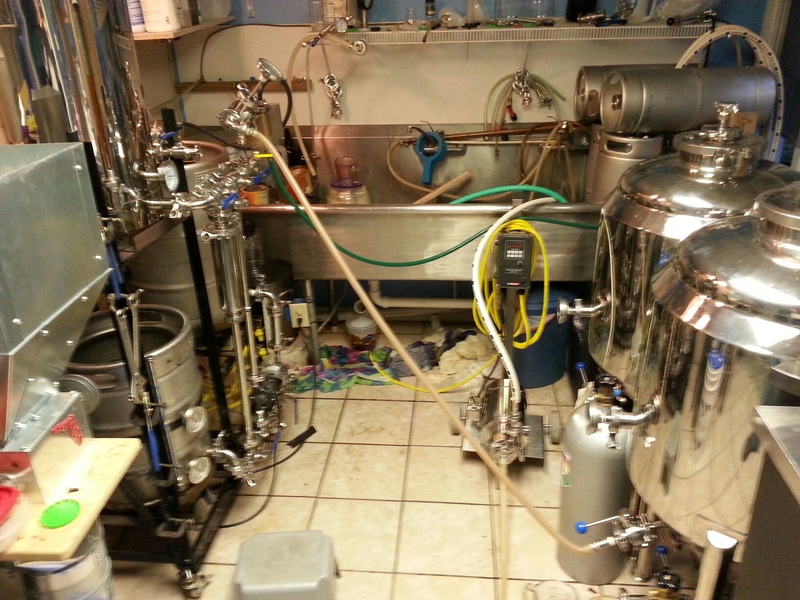 The night before I filtered the Session IPA and the India Pale Lager. The session was, by far, the quickest to filter to date. The other one was a different story as it was still cloudy. I had to break pressure and change filters after the first 5 gallons. 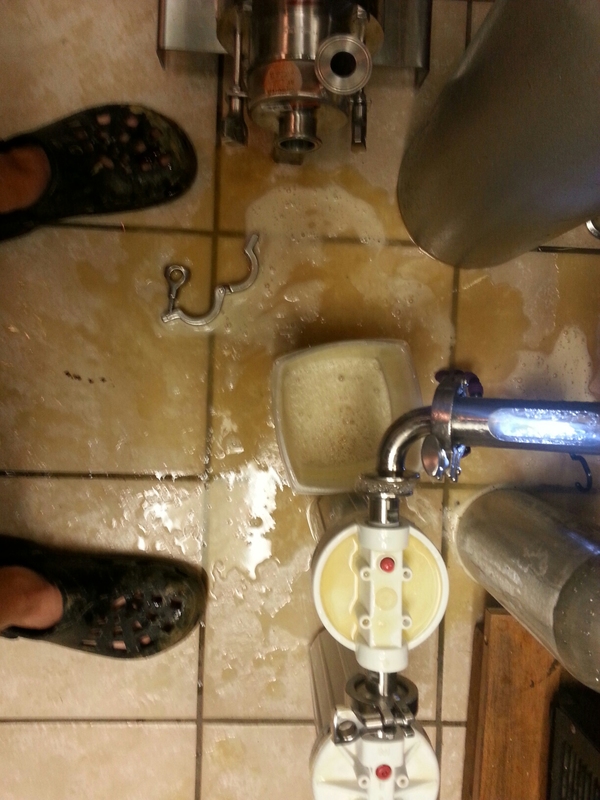 New ways to make messes when filtering beer. Beer filtering with canister filters. I got up at 6:30 am to light the fires to heat up the water. 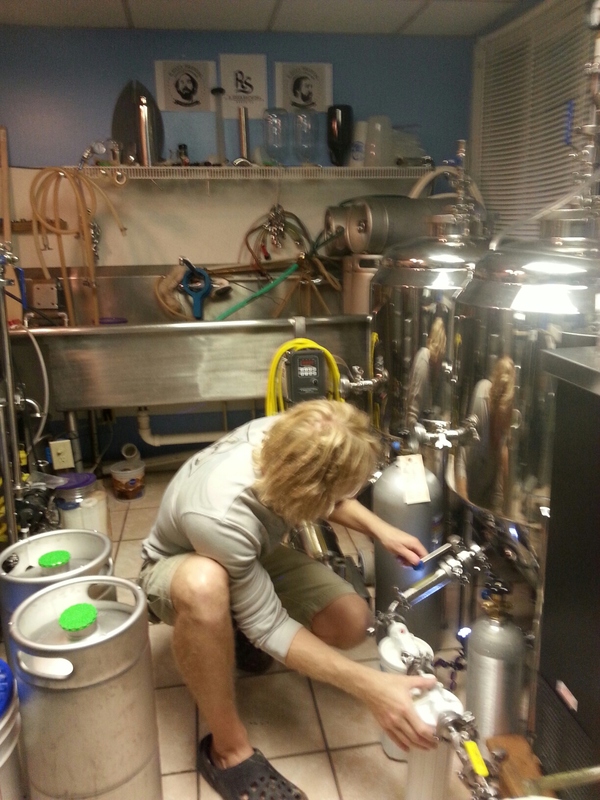 I never quite got the fermentors cleaned the night before so I was rushing to do this too. Anyways, Jesse and Doug showed up around 8am. We got the mill setup and got to work! 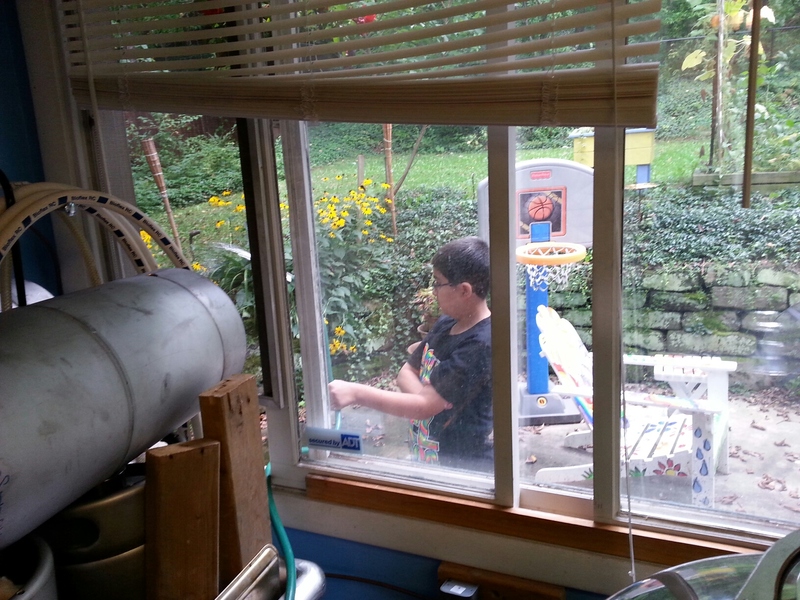 Grain milling. Doug (far left) came down from Youngstown. Daniel, Rich, Doug, Jesse, Michael…brief moment of silence for some reason. Trying out Rogue’s Voodoo Doughnut. It was a lot ‘dryer’ than expected. We definitely picked up the rasberry on the front and the chocolate at the end. I believe I was the only one who kinda liked it. I brewed the pumpkin a lot different than the prior years. I came across a great article on how the bigger breweries brew pumpkins: How to Brew Pumpkin Beer: Tips from the Pro’s. 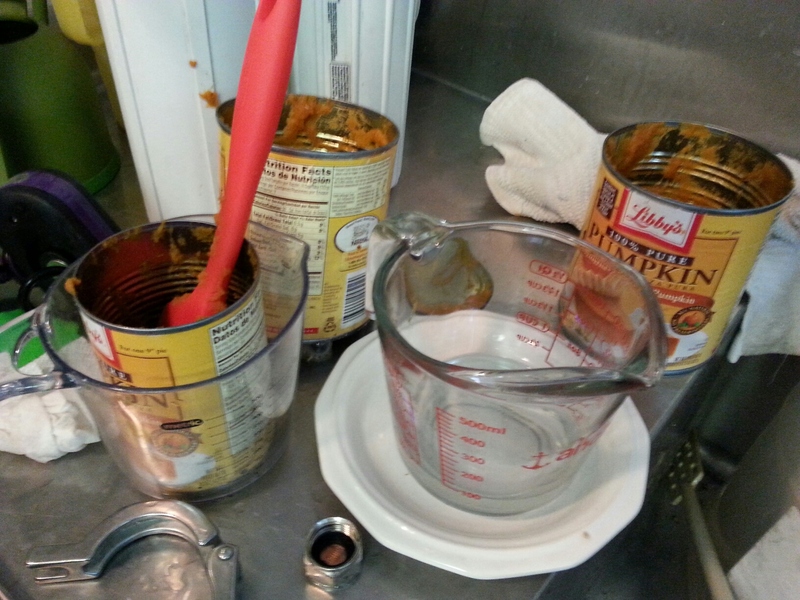 It differed greatly from the homebrew method mainly just due to the ability to process raw pumpkin at a commercial brewery size. 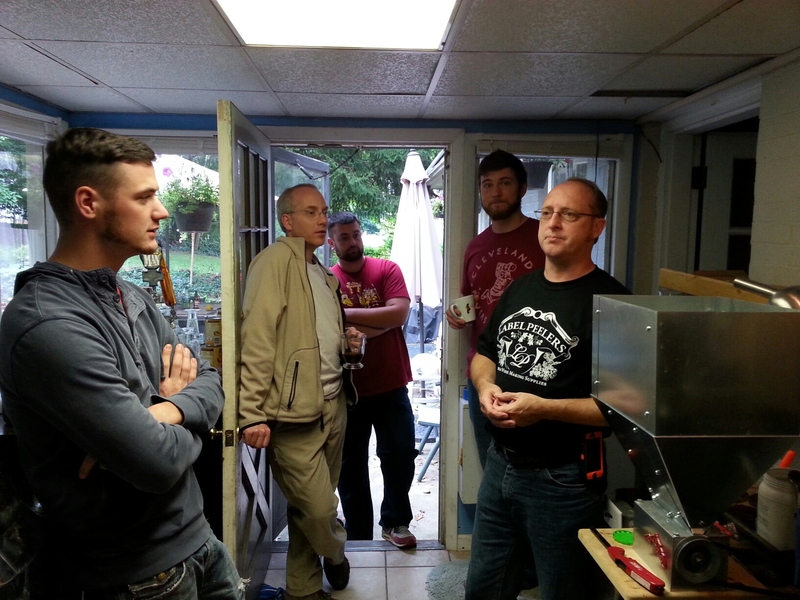 Essentially, Libby’s will always have a market amongst commercial breweries for a long time. I’m about to scale up 6x so I best pay attention. Now, we did taste one of the pumpkin beers that I have been saving. I figured if we were brewing pumpkin beer we should be drinking it. 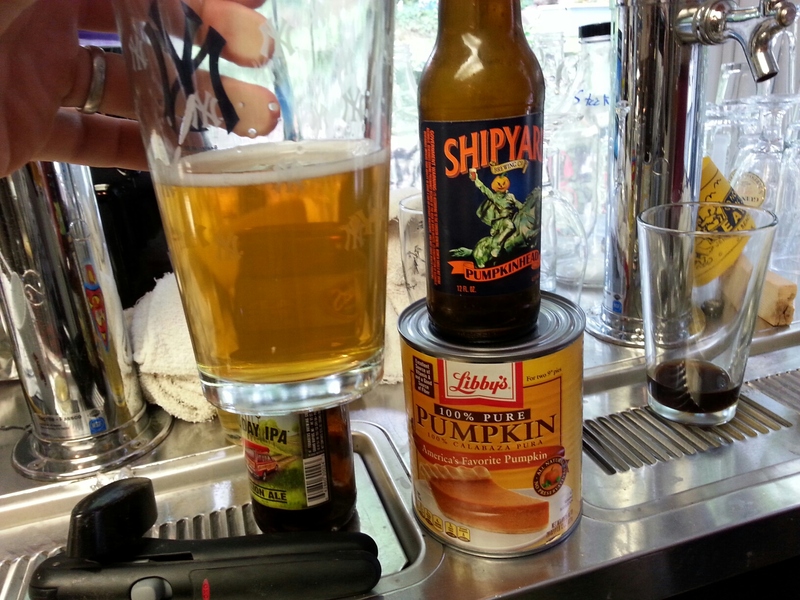 Shipyard’s Pumpkin Ale. A light pumpkin ale (which is actually a wheat beer) that is more carbonated than most and clove is the predominant spice. Even the kids help out. Final pumpout to the fermentors. My wife, worked and debut a Chili recipe for the brewery – Chili to be chili, chili to put on hot dogs and chili on nachos – food that has utility. 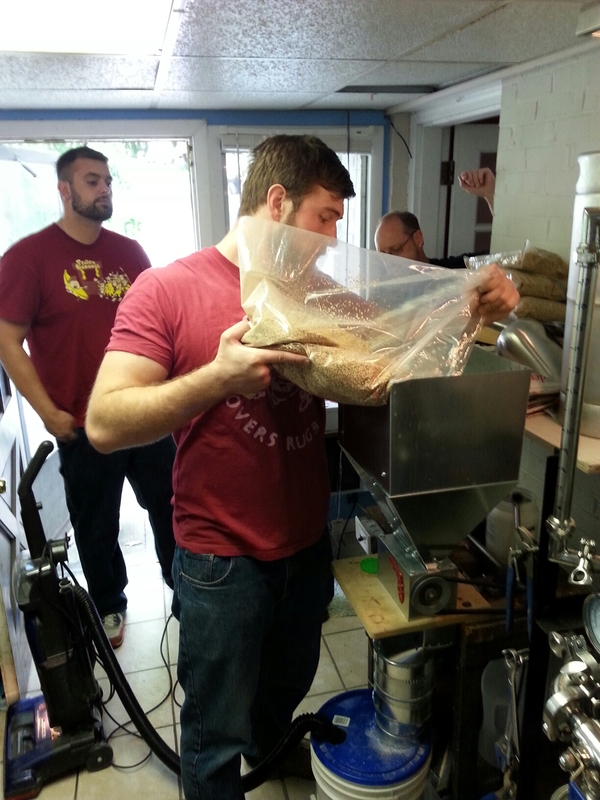 I have to thank Jesse for his great assistant brewer abilities – you impress me more and more everytime we brew. To Michael and Richard for the support, hot dog grilling skills and laughs. To Rebecca and Erika for a woman’s point-of-view on the beers and also shandy tasting. To Daniel for his great input. To Ross and Kelly, I learn a lot talking to you everytime (congrats on the engagement! – I know a guy that could provide some wedding beer). TO THE NEW GUY DOUG! It was great to meet and talk to a fellow polymer guy. You seem to have some great beer knowledge and homebrew ‘out of the box’ recipes. I hope to see more of you. To John, I know we broke you the other night but it was great to have you stop by. Thanks to everyone for making it a fun day. I got a lot of feedback on the Amarillo IPA which was a great success. The IPL and the Session IPA were OK but need some work and I know just the trick. Jesse and I will continue to work on those recipes. I mean, you can’t get ‘first time prime’ everytime! Did someone say pppppppppumpkin brew?????? I love pumpkin 🎃 brew! I like it with brown sugar on my glass rim. Pumpkin 🎃 Brew…mmm.mmm.mmmmm 😋 Keep me posted on your opening? Mailing list? 569 Northfield Rd, Bedford 44146. Can’t wait 😊! Congrats on your site & your progress.